The workshop will provide an introduction to the making of a unique and distinctly non-traditional artists or complete book. The structure will be based on a 'Drum Leaf' variant and be hard bound. Students will have the chance to explore different mediums to first make a text block and then a full cloth binding. Participants will, again, be encouraged hand colour, manipulate and further extend the bookcloth, each creating a unique book. Perfect Bindings - with Megan Stallworthy in Cornwall, Devon and Somerset. More details of all the workshops can be found at www.perfectbindings.co.uk/workshops. The Autumn 2018 season of DB Masterclasses is now available for booking. 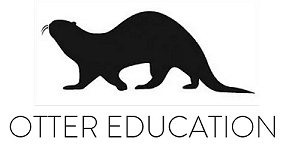 Each Masterclass will be held at the St Bride bindery in Central London with a maximum class size of only 6 students. This workshop will focus on several techniques for working with leather. First we will look at knife sharpening, comparing different approaches. Then we will practice paring leather using the machine, the spoke shave and the knife. We will produce thinly pared strips useful for joints and onlays, thin down a large piece of leather, and edge pare the turn-ins for a cover. We will finish by covering a panel, concentrating on accurate edges and neat corners. Dominic specialises in restoration and Design Binding. He was elected Fellow of DB in 2008 and in 2013 won first prize in the International Bookbinding competition. He teaches widely, both in the UK, across Europe, in Australia and New Zealand, and each summer in the USA. He co-founded the bookbinding program at the San Francisco Center for the Book, the SoB/DB joint workshops, and the SoB Seminar. He currently serves as president of the Society of Bookbinders. Leather is a fantastic medium for creative expression and its qualities of subtle and ostentatious manipulation are boundless. In this Masterclass, we will sharpen our paring knives, make sure we have plenty of spare No.10A Swann-Morton scalpel blades, a Brockman/Scharf-Fix machine to the ready, spirit dyes and paste and plenty of sandpaper of variable grit - and determination. Please bring enthusiastic experimentation and excitement. Andrew Brown serendipitously discovered bookbinding in 1989 and endured a protracted apprenticeship with Paul Delrue throughout the 90's, which was as enlightening as it was ridiculous. After 16yrs of selfemployment as Artisan Bindery, he now works for a commercial bookbinders, Deanprint in Stockport. Andrew has won most of the DB annual competition prizes (apart from the Elizabeth Greenhill and Ash Lettering awards), and has design bindings in private and public collections worldwide. During this Masterclass students will make the traditional Japanese hinged box case. This style of box provides ideal storage for various sizes and shapes of books and papers. The basic construction is a wrap-around enclosure with a 4 sided box and it contains a lift out tray. Once students learn this style of box making, the method can be adapted to wrap-around case making. Midori Kunikata-Cockram, born in Tokyo, living in the UK since 1996, graduated from the BA Joshibi University of Art and Design, Tokyo and Guildford College of Technology where she studied fine Bookbinding and Conservation. She opened the 'Jade Bookbinding Studio', London, in 1997, where she provides private tuition and works on commissioned and personal projects. Midori was elected Fellow of Designer Bookbinders in 2007. Workshop focus: Hands-on preparation of materials such as decorated papers and bookbindings, based on historical models, as well as the preparation of the specific tools and materials (ex: combs, pigments and colours); understanding of the processes involved in these productions. Workshop structure - The workshop is divided in to two parts. In the first part of the workshop you will learn about making decorated paper and in the second part of the workshop we will teach you the skills of bookbinding. Making Decorated Paper - As students preparing to marble paper in the first part of the workshop you, will be guided through the processes of both traditional decorated paper making, and marbled paper making. You will experiment with historical patterns for marbling paper including: spotted, combed, waved, curl, peacock. You will explore how to make paste and decorated papers (sprinkled, stained etc.) using your fingers and tools. You will learn about historical recipes and colour preparation, and how to replicate these with modern materials when the original materials are no longer available. You will create samples for each technique and learn how to make variations using tools, materials and patterns. 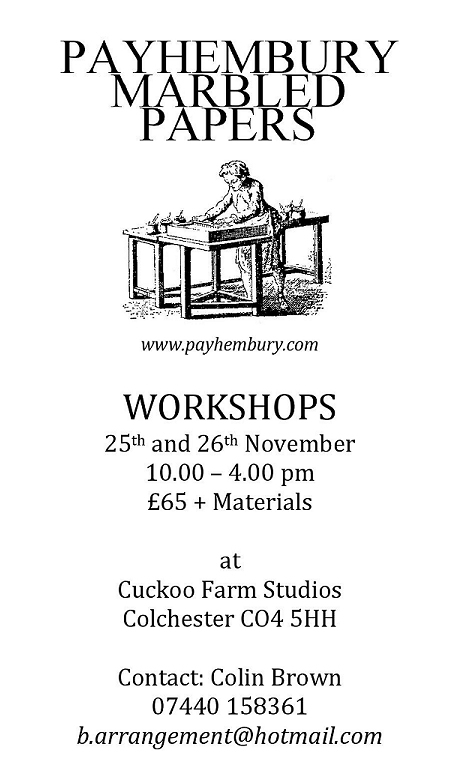 The second part of the workshop will be dedicated to bookbinding. You will learn about several bookbinding models including: pamphlets, wrappers, limp bindings, or rigid paper cases. You will have the opportunity to replicate some of these processes. The workshop will be taught by Paola Fagnola a book and paper conservator. Introduction to bookbinding, 27th October, £95. Techniques for simple cloth binding repairs and alternative styles of case-binding. Whether you're looking for a serious commitment or simply want to learn something new and have fun while doing it, there's nothing more important than being taught by an experienced Arts && Crafts Instructor. Marysa de Veer has been offering her services to people of all ages since 1993, and is here to give you the personalised attention you deserve so that you can reach your full potential. Please contact her on nicky@blackfoxbindery.com or 07929 549 140 for details and bookings. The school is committed to providing quality training in the craft of hand bookbinding. Its ongoing series of two-day workshops is designed to teach techniques that are immediately useful to the student as well as to create a solid foundation of skills for further bookbinding study. The curriculum includes both basic and advanced courses that are geared toward the needs of book dealers, collectors and anyone interested in learning the art of hand bookbinding. Each workshop features demonstrations of the techniques being taught coupled with ample supervised practice time for the student. A complete package of printed notes accompanies each of the workshops to aid the student in assimilating the body of information being presented. Workshops are taught in the studios of Cat Tail Run Hand Bookbinding near Winchester, Virginia. Cat Tail Run Hand Bookbinding is a fully operational hand bookbinding and book restoration facility established in 1991 by Jill Deiss. Instructors for THE SCHOOL FOR BOOKBINDING ARTS include Jill Deiss, Dee Evetts, Susan McCabe and Bill Deiss. Paper Marbling [Beginning & Advanced]: Students will learn many traditional marbled patterns as well as how to set up their own marbling studios. Inquire for course fee.